November ends in an “r” so it must be time for some oyster chowder. I can’t mention oysters without thinking about my nephew, Tyler. 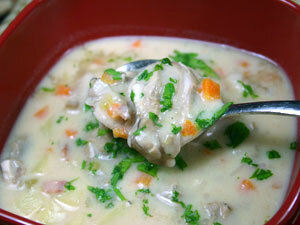 (Tyler celebrated his 7th birthday yesterday, by the way, and I made this oyster chowder in his honor.) A few years ago, The Grillmaster decided to purchase a bushel of fresh Ocracoke oysters from a local oysterman. If you aren’t familiar with the oysters of Ocracoke Island, NC, they are slightly salty and unbelievably delicious. The Grillmaster thought it would be great to take them to my brother’s house for our holiday celebration. Now, when he said “bushel,” I thought we were talking about something the size of a bushel basket of apples. “Sounds great, honey,” I said, distractedly. You would not believe how many oysters actually constitute a bushel. We had to pack so many coolers in the car, we barely had room for the Christmas presents! Tyler was barely three years old at this time and he was going through a glove fascination phase. 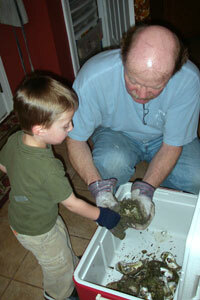 He put his gloves on and really wanted to help Uncle Grillmaster do some shuckin’. The Grillmaster popped the oysters but didn’t open them and then passed them along to Tyler. Tyler “opened” them all by himself and was SO proud. They worked at this for at least an hour. I couldn’t believe a three-year-old had such an attention span! He was much more interested in shuckin’ than he was in eatin’ (unlike The Grillmaster). This recipe is pretty close to being the perfect oyster chowder. It isn’t as thick and creamy as some, but it isn’t watery either. The onions, celery and carrots add flavor and aroma to the dish. The oysters and potatoes add texture. The cayenne and hot pepper sauce lend heat. If you don’t like heat, skip the hot pepper sauce and use black pepper instead of cayenne. Make It Ahead: Go through the step where you cook the potatoes. Add the hot pepper sauce and Worcestershire sauce, cool the chowder and then refrigerate it (for up to 24 hours). When you are ready to finish the dish, warm it over low heat. Once hot, add the oysters. Do NOT overcook the oysters. 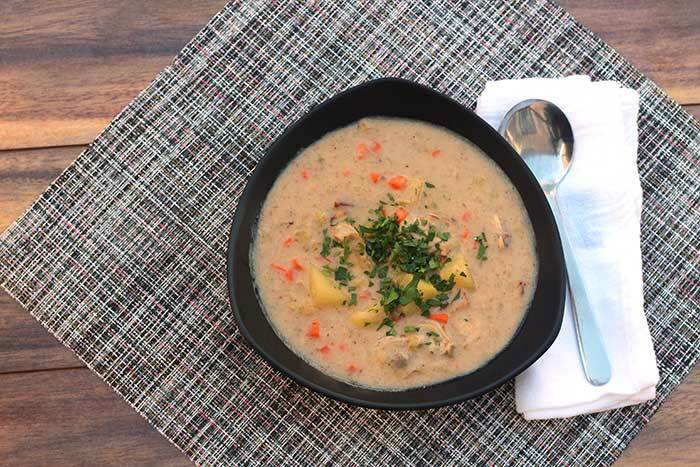 This oyster chowder is a good source of Vitamin A, Vitamin D, Vitamin K, Vitamin B12, Zinc, Copper, Selenium, Iron and Manganese. Some of my favorite oysters come from Ocracoke. Where do you find the best fresh, local oysters? Heat a large Dutch oven over medium-high heat, add bacon and fry until crisp. Add onions, celery, carrots, cayenne and bay leaves. Reduce heat to medium and cook, stirring occasionally, until vegetables are tender (about 10 minutes). Add the flour and blend well. Cook, stirring often to prevent flour from sticking, about 10 minutes or until flour has browned slightly. Add the chicken stock, turn heat to high and bring mixture to a boil. Add the potatoes, reduce heat and simmer until potatoes are tender, about 15 minutes. Add the half and half; simmer for another 5 minutes. Add the Worcestershire sauce, hot pepper sauce and oyster liquor; stir. Add oysters and cook just until edges of oysters begin to curl, about 2 minutes. Remove from heat, discard the bay leaves and garnish with parsley.